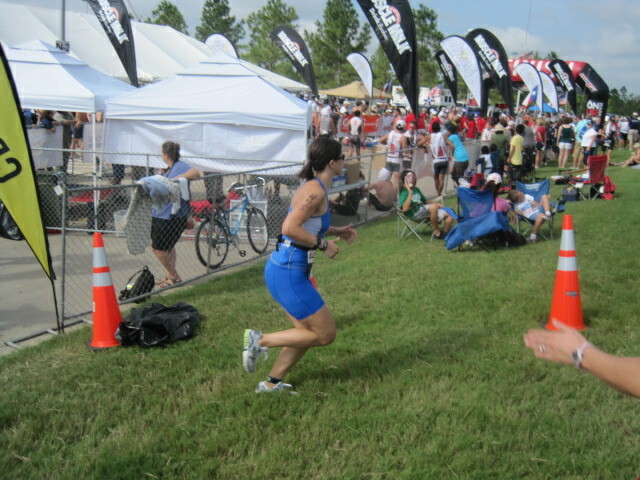 I finished my first triathlon yesterday! 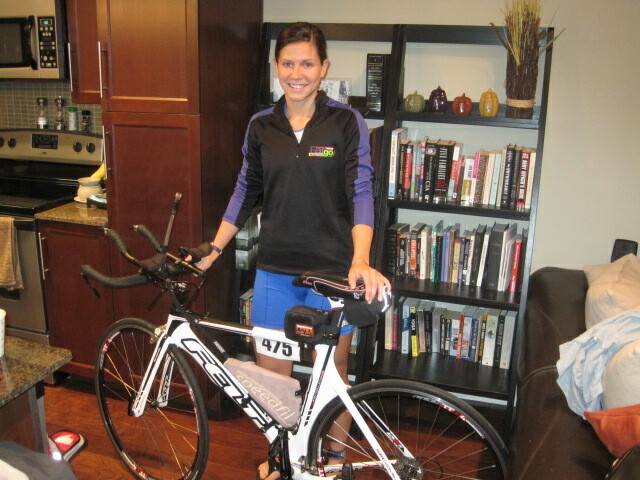 And it was Olympic distance! So yeah, I freaking did it! Didn’t chicken out and run away from the swim start (a thing I considered to be a possibility), didn’t drown, didn’t totally lose it and need to be pulled out of the water. 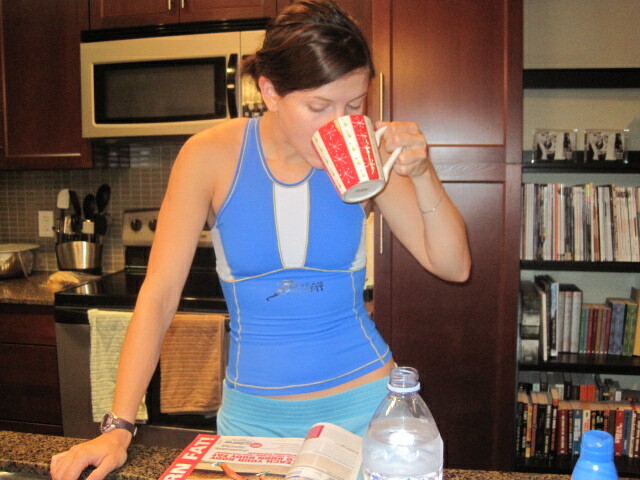 and reading Triathlete Magazine. natch. I double-checked everything on my bike, went through my backpack once more to make sure everything was in there for my transitions, and before I knew it, it was time to hit the road! 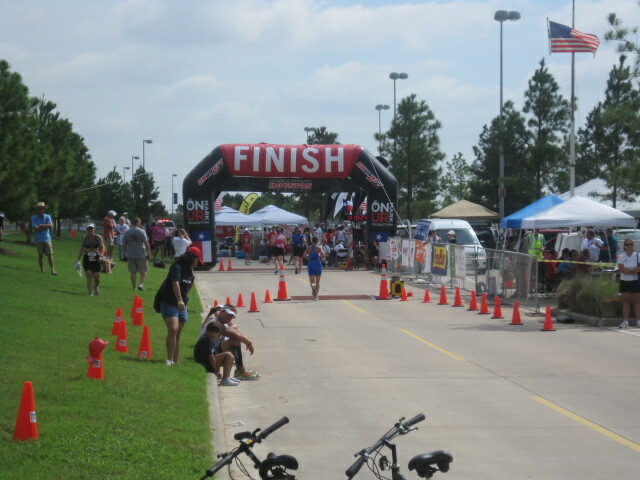 This was a pretty decent-sized race (1000 participants in the tri, no idea how many in the duathlon) so we were happy to score a good parking spot close to body marking and transition. I had all my stuff set up pretty quickly after getting marked, so we made our way over the water to see how the set-up looked. 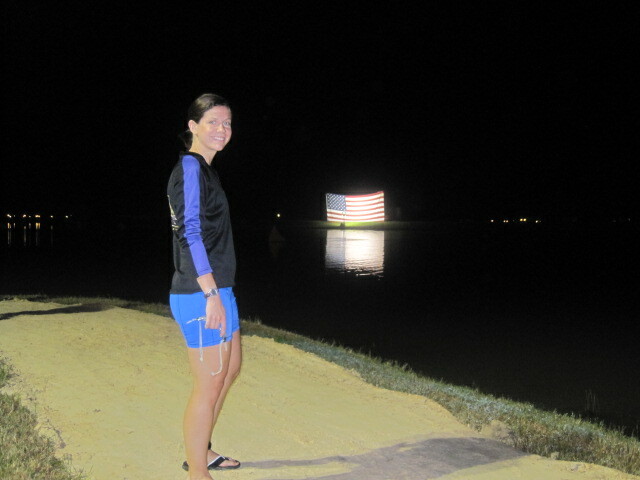 We had quite a bit of time to kill (transition opened at 5 and we were there shortly after–the race started at 7:10 and my swim wave didn’t head out until 7:50) so we filled it with a couple compulsive transition area double-checks and some bathroom stops. Soon it was time to head down to the water. 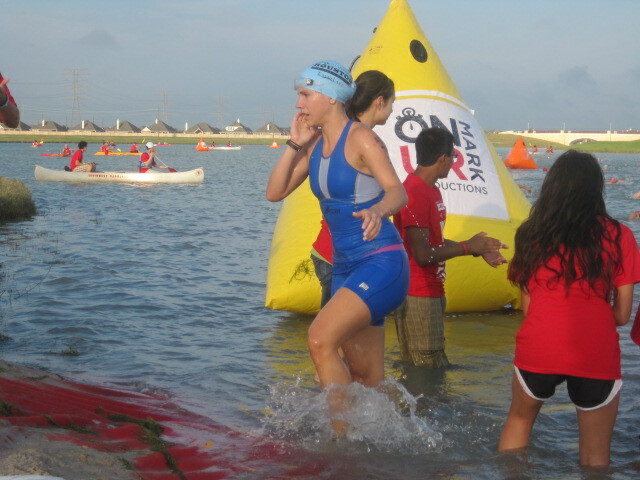 The swim was a two-loop course, 750 meters each–hence lots of staggering between waves. Unfortunately for me, waves were figured by age and APPARENTLY girls my age are assumed to swim fast–so I was in the last wave to go in the water. You know where this is leading. My time finally came after watching wave after wave head out from shore. I had a minute or two to stand in the water and I just tried to remind myself to breathe. Just breathe. there I go! look! I swim! Something very strange happened to me in the first 30 seconds or so. I was doing fine, even dealing well with the splashing and kicking, when suddenly the right side of my jaw locked shut. [Backstory: I was a HUGE band geek in high school. Like, considered music performance as a career HUGE band geek. So anyways, I developed a nasty case of TMJ from the endless hours of clarinet-playing. Every now and again my jaw will be a little weird, but it always pops right back into place. It hasn’t been a serious bother since I was 18.] So there I am, swimming, and suddenly I can’t open my mouth all the way (makes rhythmic breathing a little tricky!) Obviously this made me panic a little, and I tried my best to pop it back into place, but it was STUCK! Since this had never happened to me before I had a moment of ‘what the hell do I do now?’ and then looked out at just how far away that yellow buoy was for the turn. Oh. God. And then I remembered what Jeff had said–that everyone panics. So when it happens, roll over on your back, catch your breath, and pull it together. So that’s what I did. While I was on my back I tried to pop my jaw back into place but still with no luck. I rolled over and tried to swim again but I just couldn’t get my breathing into a rhythm without opening my mouth farther. I rolled over on my back again and tried to think clearly. Was this stress-induced? Did I lock my jaw myself? Calm. Breathe. Swimming freestyle isn’t working, so let’s do something else. And then it occurred to me to just backstroke. So I did. I started by counting 50 strokes before I popped up to sight again. It was the only thing I could make work. It took me 28 minutes to finish the first lap. 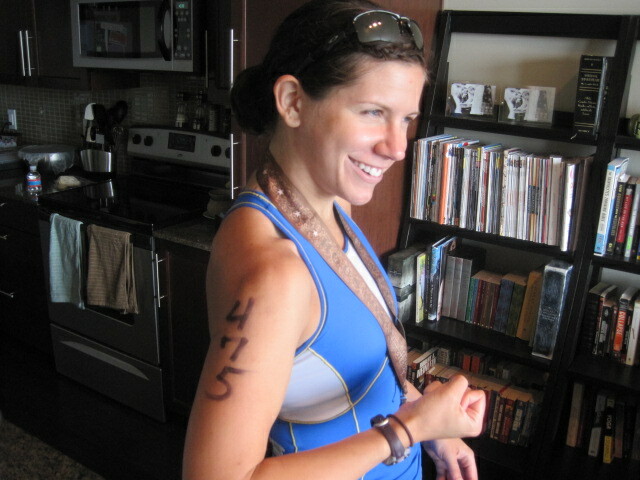 I had figured that a solid swim for me would be about 40 minutes (yeah, I’m THAT slow. Shush.) so 8 minutes off wasn’t the worst thing ever. I got up on shore, made the short run across the beach, and got back in again. 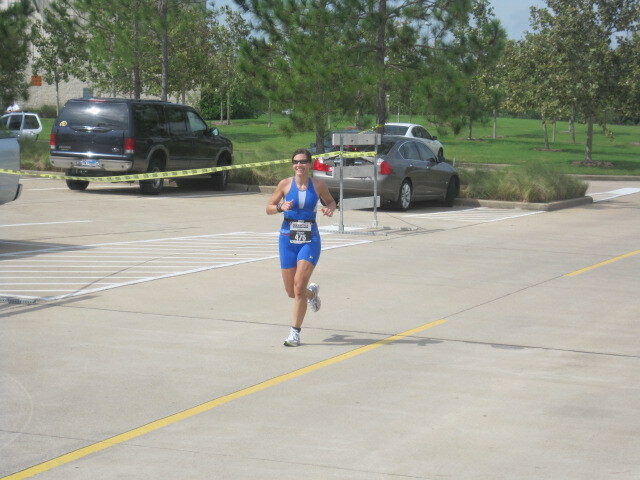 right after exiting the water from lap one. trying to figure out why I can't open my mouth any farther. 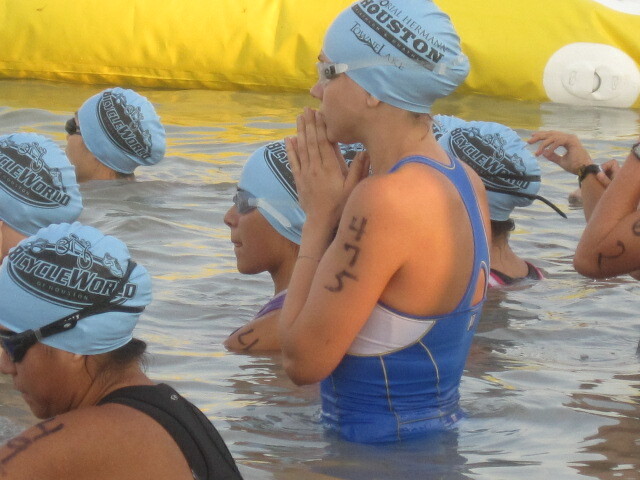 Since I knew the backstroke was my ticket to getting out of the water, I just started with it this time. And swam off course. Twice. Oops. By the time I was on my way back to shore I realized I really was one of the last few people in the water (I had told Mr. Engineer I really could be the last one out there) and it almost rattled me–until I remembered something I read on Ron’s blog a while back. I remembered reading a race recap of his where he literally was the last person out of the water, and as I recall, he still had an upbeat attitude about the whole thing. Still went on to finish the race. I decided out there in the water that being pissy about my slow swimming wouldn’t fix anything. And then I enjoyed the thought that I had lots of lifeguard eyes trained on me–who else were they going to look at? My second lap took 24 minutes, and I estimate I added at least 150 meters thanks to my superior water navigation skills. A little faster. Mr. Engineer was still on shore waiting for me, and he ran part of the path to transition with me (it was about a third of a mile.) Finding my bike was a snap–it was one of the only ones left. Where the competitive bratty monster in me might have hated this fact, I decided to embrace it. I had a solid little transition and was off for my 40k ride. The bike headed out about 3 miles and then took a two-loop cruise out of town. 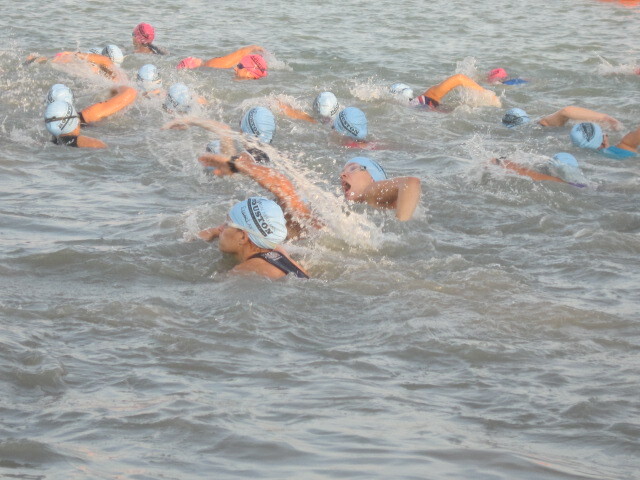 I did catch some people here, but not that many–since I was in the last swim wave, I had not only my slow swim to make up but also the stagger in start times. I found a groove and just pedaled away though–when we weren’t in the wind I was solidly holding on to 19 mph (fast for me!) and feeling good. About 10 miles in the mass quantity of lake water I had swallowed started to give me some stomach troubles, and I ended up having to abandon my nutrition plan because seriously–my stomach was so full. Yuck. I tried to sip Gatorade, and I did get half a gel down with some (non-lake) water, but that was it. The bike was thankfully uneventful. Final speed was 17.4 mph. A decent ride for me. At the dismount line I had my right foot unclipped and as I slowed I tried to pull my left foot free but it was totally asleep and wouldn’t give. And then I tipped over at the dismount line. All I could do was laugh. I ran my bike in, changed my shoes, grabbed a throw-away bottle of water, and cruised out. the scene of my graceful spill. ha. so I still have to run a 10k huh? I ran the first mile in 8:30ish and then the slosh in my stomach made it apparent that pace would not be sustainable. I slowed down a little and just tried to reel people in where I could. It was a little hot for my taste, but by Texas standards it really was a mild day. I couldn’t manage any fluids the first few miles–I really felt like I might puke. 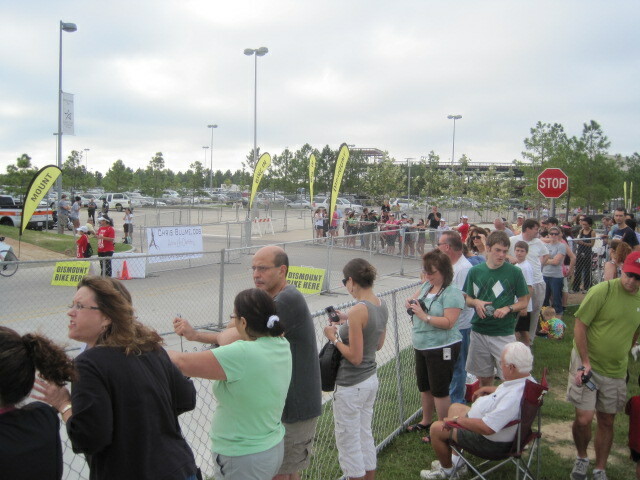 At mile 4 the course turned into a stadium that they made us run up and through. That was a fun little surprise. So I’m comforted by the fact that even if this had just been a 10k a PR would not have been in the cards–the course was a little silly. I finally got some Gatorade in me shortly after the stadium, and tried to pick it up a little. Even with the vomit-feeling and the knowledge that I wasn’t breaking any time records here, I was really happy. I was about to finish! finish line, I love you. we just happened to stop for a photo here. no medical tent for me! My total time was 3:38 something. Not amazing at all, I’m aware–but that’s ok. I had figured coming in just under 3:30 would be a BIG win for me, and considering how badly the swim went, coming within the ballpark is still respectable. Even though I was out there with very few people most of the day, a look at the results tells you that I finished in the top half overall, which seems alright in my book. So hey, I did it. 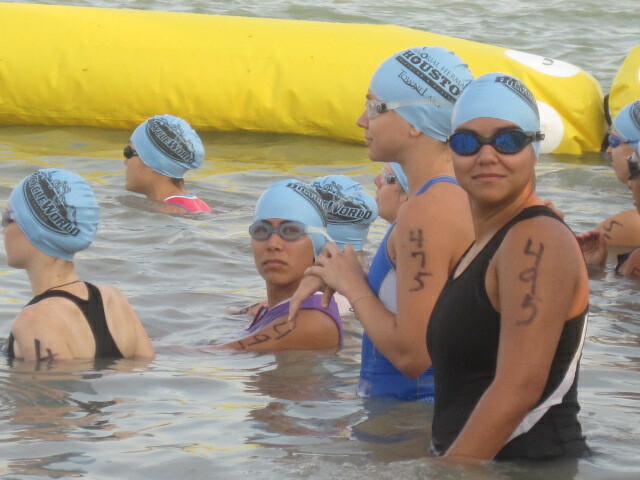 I conquered my fear of the water, swallowed my pride on being in the back of the pack, and did the best I could. And the best part? I’m totally hungry for another one. Great race Jenn! What a great write-up too! I’m so geeked that I want to do one! 🙂 Just need to practice swimming and buy a road bike…. See you at Chicago! Hi Belinda,Im a fan of both sites!My favourite chodlhoid summer memory is every summer my whole family would get together and stay at a holiday house by the beach. Coming from a Croatian background all my Aunts would cook enough food for an army, and my Uncles would bring their accordions and guitars. All us kids would spend hours at the beach swimming before going back to the house for lots of wonderful food, singing and dancing. This memory in my mind sticks out because everyone was laughing and enjoying the summer time. The best part was we got to go to bed and wake up doing it all again the next day. Way to go Jenn, I am really proud of you! Mr. Engineer did a great job of taking pictures, you look tough out there. Congratulations, you have proven once again your badass status. Great job and good luck in Chicago! Awesome!! Way to go Jenn!! What an accomplishment—even more impressive for having to conquer some mental demons right from the start! And as usual, wonderful pictures! Hey! Congrats! 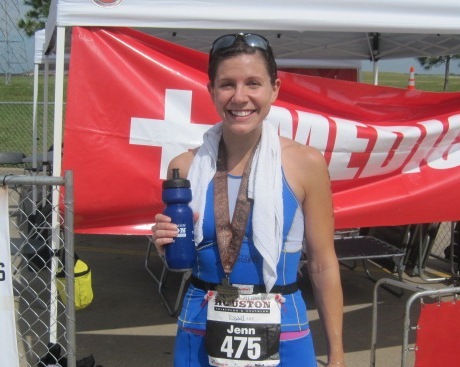 I’m one of Jeff’s other athletes – amyaggie05 on Twitter :). I see that you moved to Houston. I grew up there, and yes, it is very, very hot. I live in Denver now but my family is back there. 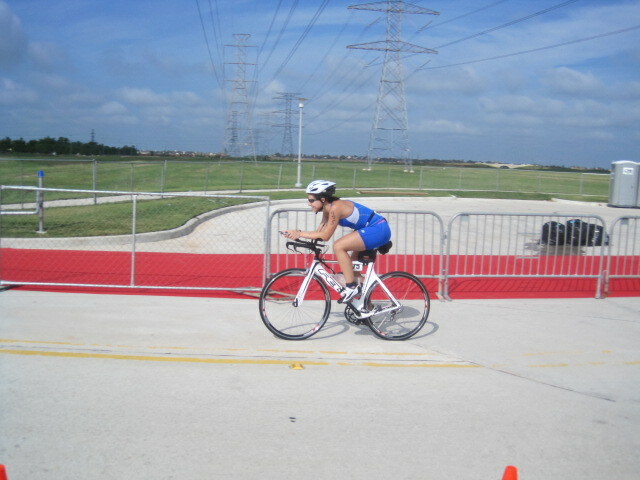 My sister is very into triathlons and lives in Houston. 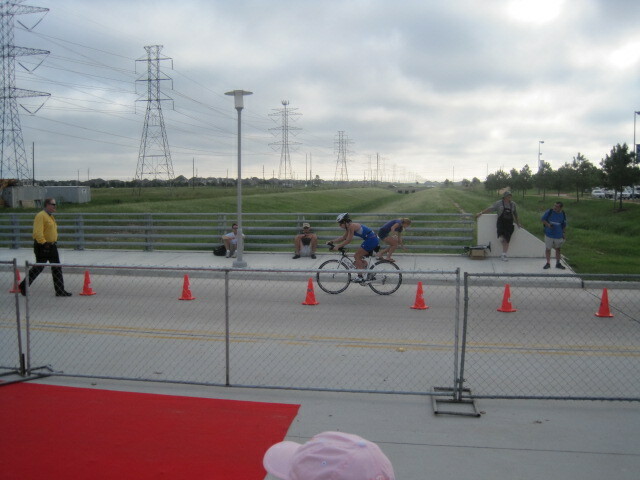 We actually did the Bridgeland sprint tri put on by OnUrMark back in August. So hot!! Hang in there – you do adapt to it somewhat!! My favourite chodoiohd memory is spending time with my grandparents at their St George based family home. I love the cool feeling of the walls to escape the outside heat, the time spent with my brother skipping from the jettys investigating the tiny crabs and jelly fish at low tide.Climbing under my nans house to see the treasure trove of toys stored there from my aunties toy business. She had a lolly jar that I never touched and being So excited when she would let me watch telly, drink cordial from the colourful cups and eat a lolly. Going boating with grandpa and exploring the dark cold underground garage where he grew mushrooms. Just the simple pleasures in life and smell of salt water will stay in my memory. Great, honest, race report. I too have gone off course on the swim part and am always relieved that I didn’t drown. I’m debating between an Olympic and a half next year, I figure the swim is about the same so I would have more time to make up for the bad swim with the longer bike and run…maybe. Great job!